Kitchens are going to look a whole lot different in 2019. Say goodbye to traditional cabinetry, stainless steel, granite, and even upper cabinets! The kitchen of 2019 offers the chance for homeowners to express much more character than ever before. 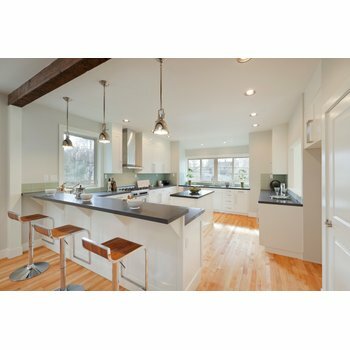 With research indicating that many homeowners will focus on remodeling their kitchens next year, we expect to see the following trends come to fruition. White cabinets stole the show in kitchen design in 2018. Homeowners went all out with not only white cabinetry but white countertops and white backsplashes. The white kitchen is a classic and timeless option, but it also doesn’t offer much personality. In 2019, designers expect earthy blue and green cabinetry to be the new “white.” If you’ve been wondering why you’ve seen so many navy kitchen cabinets on home remodeling TV shows recently, now you know. Black stainless steel has been on the radar for a few years now, but a few new coinciding appliance trends may finally help homeowners make the transition away from stainless steel. 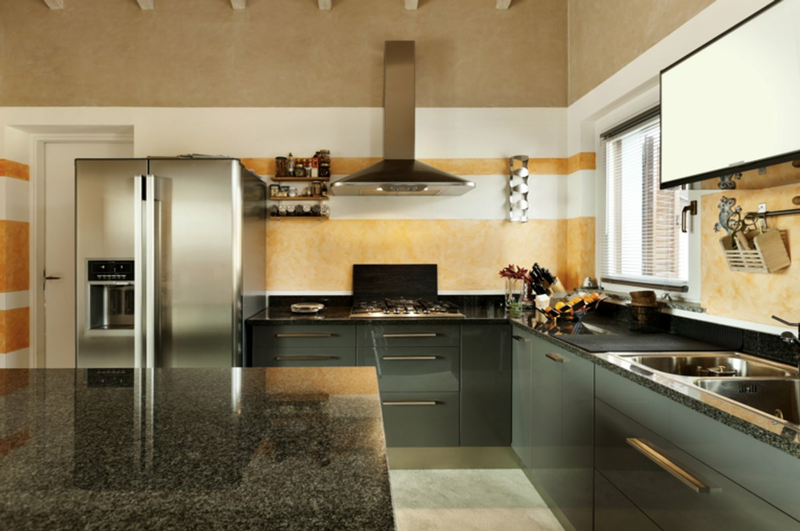 Black stainless steel and matte black appliances are particularly easy to meld into an existing design scheme. They look sleek and modern, and they’re especially practical because they hide dirt and fingerprints much better than stainless steel. However, in fitting with the blue and green cabinet color trend, manufacturers are also offering more stylish options. Homeowners can opt for bold, colorful appliances that steal the spotlight. Whereas it’s easy to find black stainless steel from the major appliance manufacturers, you may have to seek out some high-end options to get a more colorful option. We’ve seen this trend coming, but quartz continues to gain traction, making granite more and more dated. Again, trends are taking a practical turn since quartz is known for being easier to maintain and keep clean than its competitors. It’s non-porous, meaning it won’t stain easily, it’s hygienic, and it’s durable. This also means it never needs to be resealed. It comes in a wide range of colors to mimic natural stone and even concrete. Thanks to its practical, low-maintenance and durable appeal, luxury vinyl tile (or LVT) is gaining traction in kitchens. 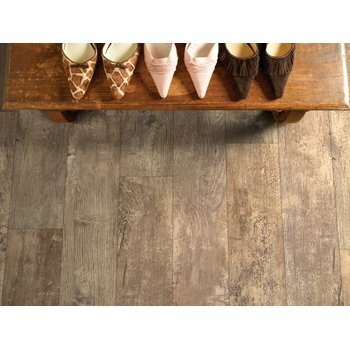 This flooring material has gotten almost perfect at mimicking other materials, such as hardwood and natural stone. And now, LVT is available in waterproof options, making it ideal for kitchens and bathrooms. In 2019, experts expect vinyl to be the “new go to flooring” in patterns such as herringbone, chevron and diagonal. When replacing kitchen flooring, many homeowners also consider adding in-floor heating. An electric floor-heating system is gentle enough to work under LVT but effective enough to add noticeable warmth to the room. Because the kitchen is the “heart of the home,” it’s a great upgrade to consider — especially if you already have plans to remove your existing flooring. Though it might seem strange to imagine a kitchen without any upper cabinets, it’s becoming the trend. Instead, open shelving is taking the place of upper cabinets to create an open, airy, minimalist feel. Showcase your dishware or décor on glass, wood or metal shelving to achieve the look. If kitchens are getting more colorful with cabinetry and appliances, the hardware has to get more interesting too, right? The brushed brass hardware trend continues to gain traction in the kitchen; however, various shades of gold and copper are being added to the mix. But don’t worry — you don’t need to switch out the door knobs and hinges throughout your home. In the kitchen, this trend simply applies to knobs and pulls as well as faucets and range hoods. Because many of these trends are so bold, you’ll want to be strategic about how you use them. If done right, the result will be an upscale, low-maintenance, open and airy kitchen filled with character. Next Post How Energy Efficient is Electric Floor Heating?